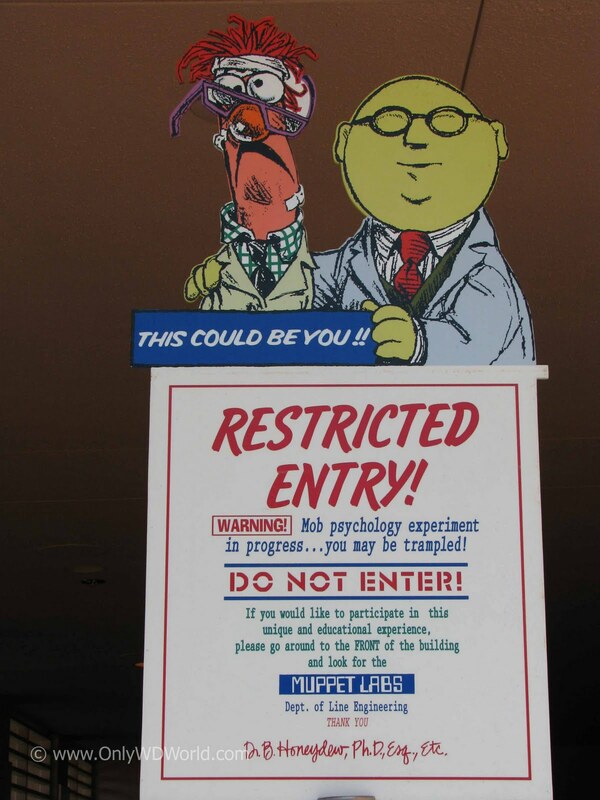 Muppet Labs is the home of Muppet favorites Dr. Bunsen Honeydew and his faithful assistant Beaker. 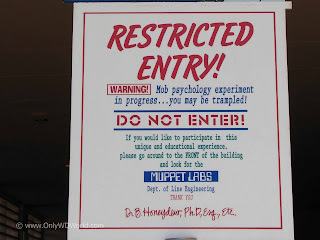 At Disney's Hollywood Studios, where the Muppets call home at the Walt Disney World Resort, there are a number of great signs from Muppet Labs that you should definitely check out. The Muppets are the masters of the gag. 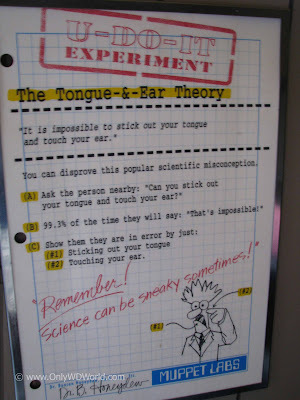 At Muppets Labs they bring their own brand of science to entertain and make you laugh. 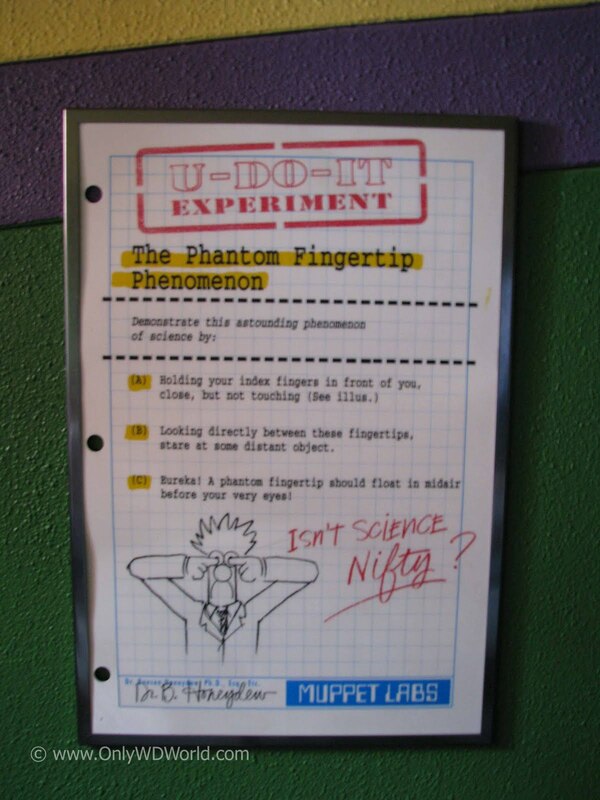 The series of U-Do-It experiments are designed to give you some fun "tricks" to take home. 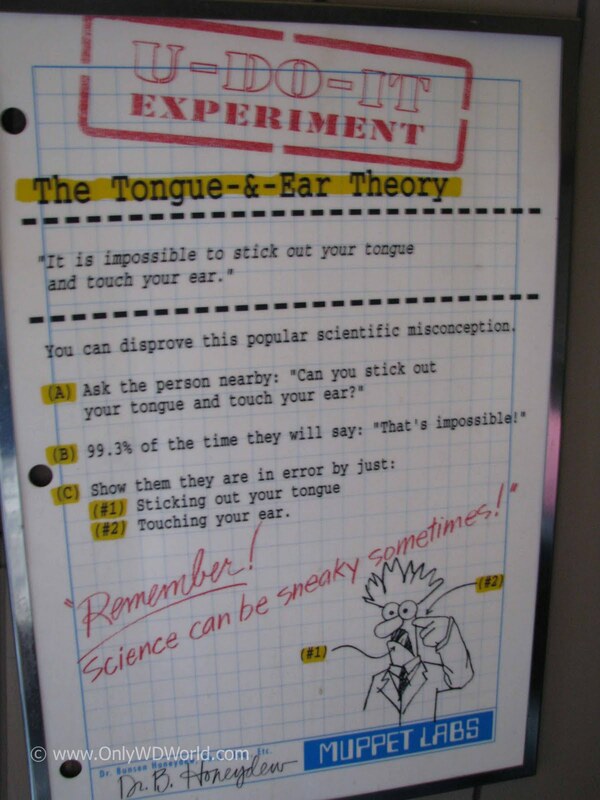 This trick involves the old notion that it is impossible to stick out your tongue and touch your ear. Ask the person nearby: "Can you stick out your tongue and touch your ear?" 99.3% of the time they will say: "That is impossible!" Remember that Science can be sneaky sometimes! Looking directly between these fingertips, stare at some distant object. Eureka! A phantom fingertip should float in midair before your very eyes! 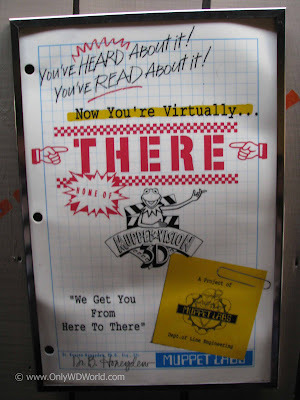 Studies show that our rumor will get back to you 32.7 minutes after you share it with the person standing next to you in line. "I saw ELVIS waiting in line a Muppet Vision 3D." Did you realize that the Muppet Labs invented the Water Fountain? 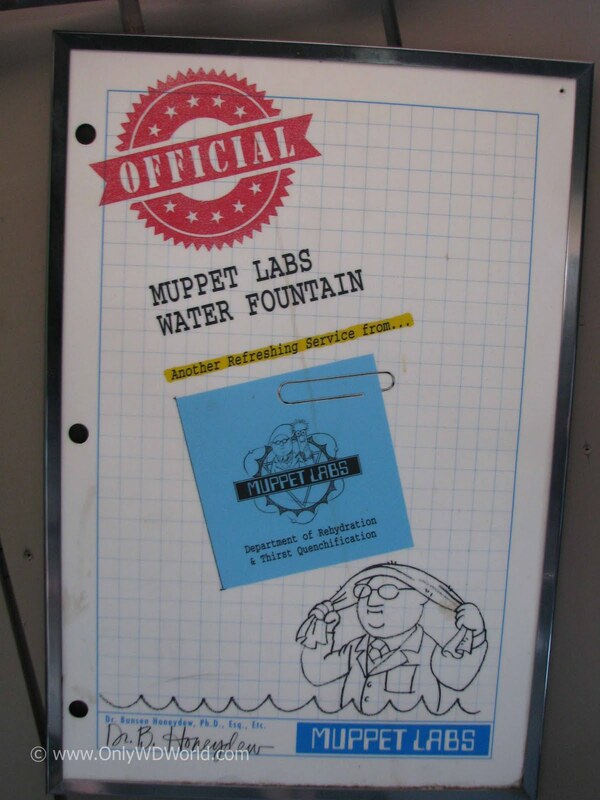 Yes, this was just another refreshing service from Muppet Labs Department of Rehydration & Thirst Quenchification. 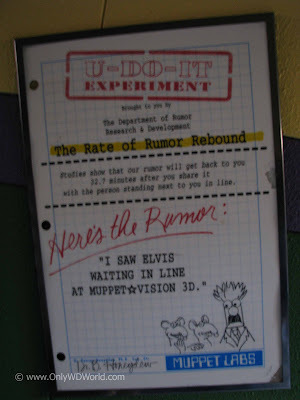 The Muppet Labs are even known to conduct experiments at exits to attractions, like this Mob Psychology Experiment at the exit to Muppet Vision 3D conducted by the Dept. of Line Engineering. The Muppet Labs Dept. Of Line Engineering also creates helpful signs to let you know how much longer you have to go in your journey to the attraction. The Muppets bring a tremendously fun element to Disney's Hollywood Studios. 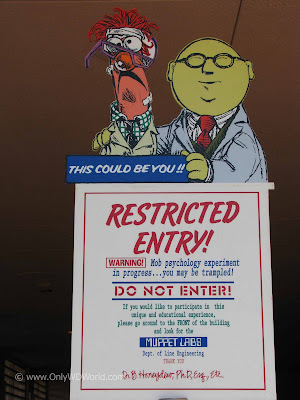 There are a wonderful collection of gags and signs that any Hollywood Studios guest should take the time to wander the area around the Muppet Vision 3D Theater. There are so many items to catch the you will never see it all in just one visit. 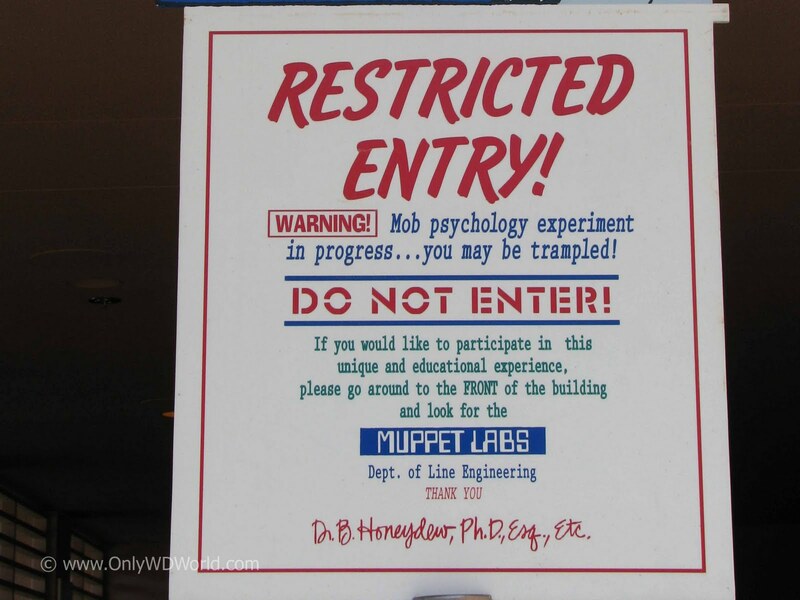 These signs from the Muppet Labs are just a small taste of what there is to enjoy. 1 comments to "Muppet Labs Make Science Fun At Disney's Hollywood Studios"